Designed with timeless style and elegance, the Prepac contemporary dresser works with a wide variety of decor. It's constructed with a sturdy solid wood exterior and stunning white finish. Save on space, but not on style, with the Liberty Dresser that's perfect for a bedroom or office space. With four full-extending drawers and one slight open cubby space, this piece is modern design coupled with versatile style, and blends well with any existing decor. Equipped to hold a 32" television, this multi-purpose piece is one that functions well anywhere. Classic Mid-Century splayed legs finish off the piece and are built from beautiful solid wood, ensuring this piece will remain a staple for years to come. Featuring ample storage space without compromising on design or style, the Sullivan dresser is transitional and functional, blending well with all decor while keeping your favorite clothing and items stowed away, free of fuss. A clean finish offers the perfect backdrop for presenting framed photos, jewelry stands, perfume bottles, or television screen. In the bedroom or guest room, this piece will anchor your space and keep it current. The Astrid 6-Drawer Dresser with Crystal Knobs has a contemporary design and clean lines that complements a variety of decors. Profiled drawer fronts and acrylic crystal knobs add a beautifying touch. Use on its own or pair it with other matching pieces from the Astrid Collection. At 47.25" wide, this classic design gives you lots of room on top to showcase treasured items like jewelry boxes, lamps and photos. Manufactured in Canada and meets all North American safety standards. The Prepac modern chest comes in a truly timeless design, perfect for all kinds of decor styles. Its gorgeous manufactured wood exterior and white-coloured finish really make this piece stand apart. Calla 58.5-inch x 29.75-inch x 15.25-inch 6-Drawer Dresser in White Designed with timeless style and elegance, the Prepac contemporary dresser works with a wide variety of decor. It's constructed with a sturdy solid wood exterior and stunning white finish. Calla 58.5-inch x 29.75-inch x 15.25-inch 6-Drawer Dresser in White is rated 3.2 out of 5 by 5. Rated 5 out of 5 by KJ5518 from Very nice dresser! It came in a lot of pieces... Very nice dresser! It came in a lot of pieces and takes time to put together, but once it is all finished it is worth it! Rated 2 out of 5 by Meg from The dresser looks nice but the directions, or lack there... The dresser looks nice but the directions, or lack there of, are VERY unclear. This took hours to set up and I wouldn't recommend buying this if you don't have patients or time. 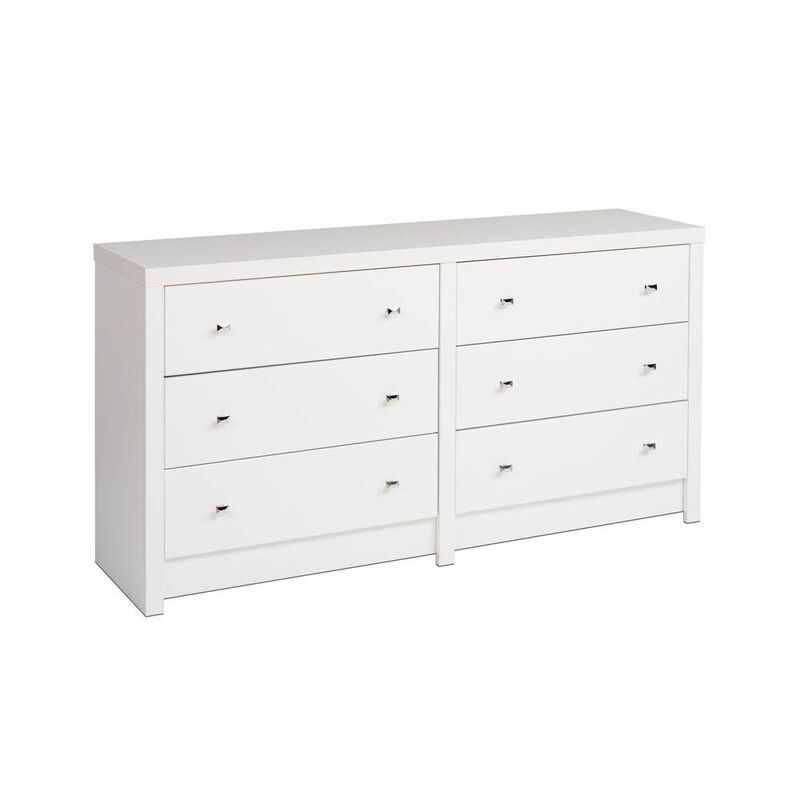 Rated 3 out of 5 by Dresser from Some pieces came damaged and was very time consuming to... Some pieces came damaged and was very time consuming to put together. Drawers are pretty shallow but overall what I’d expect of lower end furniture. Does the job. Rated 1 out of 5 by Heather from Received this missing pieces- had to reach out to company and weeks later still have not received... Received this missing pieces- had to reach out to company and weeks later still have not received all the parts to finally put this together.